Disclaimer: It is never my intention to offend, just to amuse and sometimes inform, so I apologise in advance if anyone finds anything in this post unsuitable. I have never been one for buying the latest must-have brands or indeed any labelled goods and actually find the whole process of shopping quite difficult. 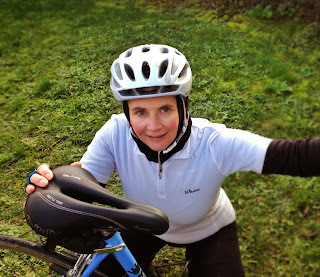 I was very lucky to be given some money at Christmas to spend on myself and totally failed to find any girlie clothes whilst in the UK, but I have found some special girlie purchases to enhance my cycling experiences. In the January sales I treated myself to a new saddle for my road bike, much more useful than a handbag or high heels. Please meet my new best friend Donna the Selle Italia Gel Flow, with attractive pink stitching and the claim that she has been designed specifically for the female form. Let’s be honest ladies, in those regions we are quite different from men. Donna’s biggest asset, as far as I’m concerned, is the bit she is missing, the perfectly placed central cut out that provides relief and protection for my most delicate area. The rest of the saddle is gel filled, supportive and comfortable. The shock absorbers do indeed absorb the shocks from the bumps of uneven road surfaces, something that on my previous saddle would ripple right through me in an unpleasant way. I have yet to give Donna a long distance work out, but all I can say is bring on the kilometres, together I’m sure we can achieve anything. It would be no exaggeration to say that on our first test run my girlie delicates were positively singing with pleasure, or maybe that was just the wind whistling through the gap! In the same way a good saddle has made a whole lot of difference to my riding experience, so has my new Specialized Women’s Sierra helmet. My previous cycle helmet was bought years ago when I really didn’t know much about good fit. It never tightened enough to grip the sides of my head, but always left a dent in my forehead. My new Specialized Sierra not only fits my head, gripping all around, it is also much more comfortable, leaves no dent and looks more stylish too. With the super padded cycle shorts I treated myself to last year (see here) I’m now totally kitted up for what I hope will be a great year of road biking. The next step for me will be fitting the pedals that enable my shoes to clip in; I have so far avoided them as I know I will fall off at least once before releasing my feet becomes second nature. With Donna's support I'm ready for any challenge.